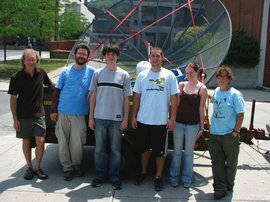 Physics faculty and students with the dish section of the new telescope. Learn more about the research opportunities and other classes in the physics department. With help from physics professors Matthew Price and Bruce Thompson, students Chris Stathis ’11 and Ivan Tso ’15 constructed the electronics for a new radio telescope, which now sits near the Clinton B. Ford Observatory on campus. A radio telescope looks similar to a large satellite dish and detects and collects information from radio sources in space. What began as a senior thesis project will soon give physics students an opportunity to use the telescope to gather data and conduct hands-on research. Recently the team was excited to witness the telescope’s “first light,” or signal from the sun. With the telescope right on campus, students will learn to set up and fix the equipment themselves—practice that will make students competitive when applying to graduate school or breaking into the industry.